Those who are superstitious traditionally fear magpies. To see a single Magpie is thought to be unlucky. In fact this is not true and should be reversed. A solitary Magpie is a lucky symbol, a precious gift. When you are alone and you see a solitary Magpie it is offering you a wish. 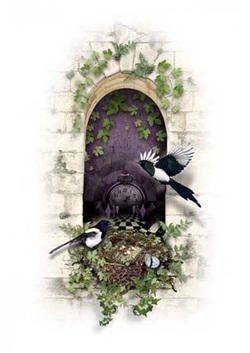 When your wish comes true you will appreciate the Magic of the Magpie and you will realise that malevolent spirits, which desire the magic for them selves, shaped this deception to prevent you from accepting the gift the magpie wish to bestow upon you. Magpies are monogamous and stay together year after year for their entire lives. This is why a pair can be seen a symbol of joy, marital bliss, and long lasting fortune. The bond the magpies have is so strong that if their partner dies, the widowed partner calls other magpies from the surrounding area for a mourning service. This has been observed many times and it is a heartbreaking thing to see. It almost sounds like they are trying to talk the dead partner back to life. Each spring the male tries to impress the female by performing an elaborate dance with his wings. The male and female work as a team to create a nest out of twigs and mud, the inside is lined with roots, grasses, and hair. Often the nest will contain shiny treasures that the Magpies have found. Magpies and songbird decline: To discover whether magpies could be to blame for the decline, the RSPB commissioned the British Trust for Ornithology (BTO) to analyse its 35 years of bird monitoring records. The study found that songbird numbers were no different in places where there were many magpies from where there are few. It found no evidence that increased numbers of magpies have caused declines in songbirds and confirms that populations of prey species are not determined by the numbers of their predators. Availability of food and suitable nesting sites are the main factors limiting songbird populations. valley, seen their stories, felt the warmth of their happiness and cried with them through their sorrows. Today there is a new stillness that exists within my heart. When a new life bursts forth all nature breathes and sings united. The spirits of the wind and rain rejoice, welcoming my little one. I stand proud and strong beside you my little one. I pass to you all that I know, all that I have seen, all that I have felt. 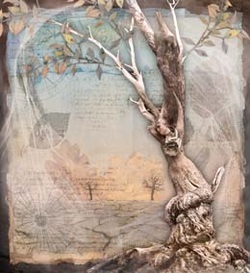 The original inspiration for this image came from an old tree stump on a limestone outcrop. This stump can be found on Back O Th Fell Road, near Lindale on the way to Cartmel Fell. The view is accross the Cumbrian fells and hills. 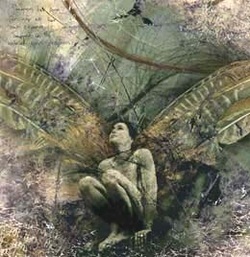 Hamadryads are tree nymphs, embodied by the tree that houses them. They are unable to leave the tree and live and prosper as it does. As more and more ancient woodlands are devastated by civilisation, the Hamadryads are dying out. This Hamadryad stands alone now, where once a magnificent forest surrounded her. 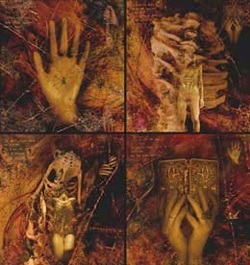 One by one her sisters fell, destroyed by man. Now she too is dying. She is the last of her kind. 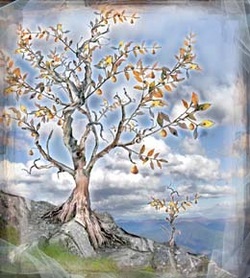 The original tree can be found at Old Park near Holker in Cumbria. The cracked sand was inspired by Morcambe Bay sands during hot spells in summer. A very recent image that captures Lancaster. When we are children the whole world is and exciting adventurous place where anything is possible. Sadly for many as they grow older they lose there imagination as their life is taken over by the mundane and perceived laws of order in the world. Your imagination is what gives birth to your ambition, dreams and desires. If you lose your imagination – you lose the ability to see yourself as someone greater, better and deeper than you are today. You can use your imagination to reach your goals. If you have the ability to imagine it you have the ability to achieve it. 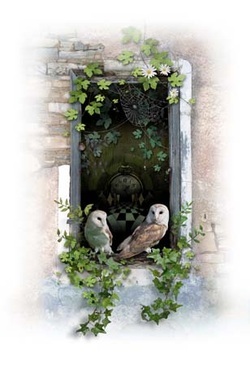 Featuring two Barn Owls from Leighton Hall, Carnforth. Lancashire. Inspired by the old Irish Fairy tale 'The Children of Lir' this image features the Ashton Memorial in Lancaster. 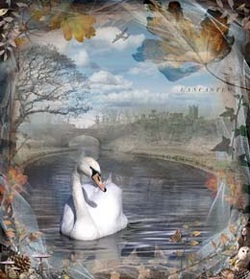 The swans are from Lancaster Canal. 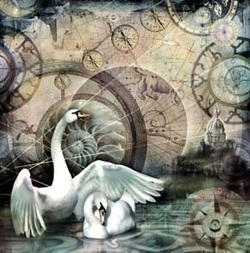 Limited Edition Prints of this image have been purchased as a wedding gift and anniversary present as Swans are Monogamous and therefore are the perfect representation of Marriage and commitment. The Ashton Memorial was commissioned by James Williamson - Lord Ashton - as a tribute to his late wife, and this beautiful building has been associated with love and romance ever since. Trapped in the Web of your Deception"
Signed, Limited Edition Prints. Square images are approximately 43cm wide.